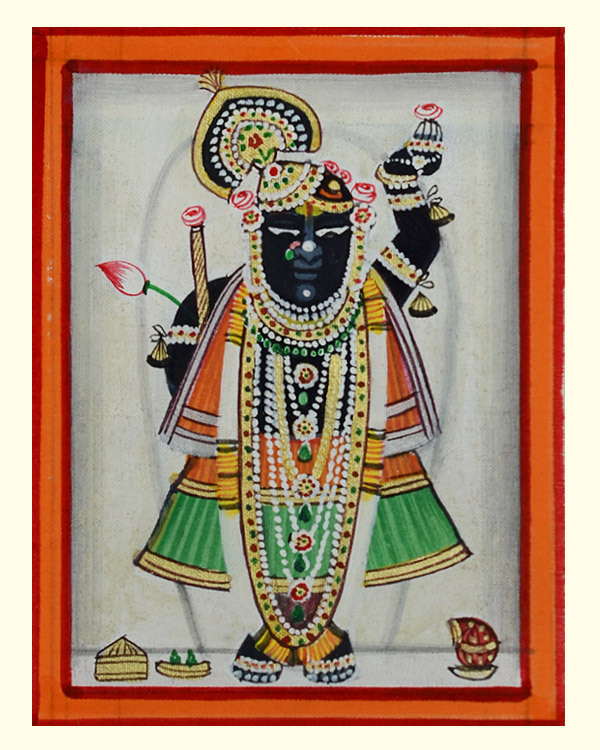 About Product : This finely painted Miniature Pichwai done on a silk base portrays Srinath ji in Temple at Nathdwara. A grand procession is on its way from the palace. There are soldiers on horses, ministers riding on camels and the king and queen are sitting high atop a beautifully decorated elephant. There are dancers and musicians also going along, a group of women carrying flowers; all surrounded by reverberating drum beats. A scene rare and full of grandeur…. But who will remember this and tell its stories? Sitting alongside the road, carefully observing the procession, are someartists, busy making quick sketches… history for the future generations will be based on these. 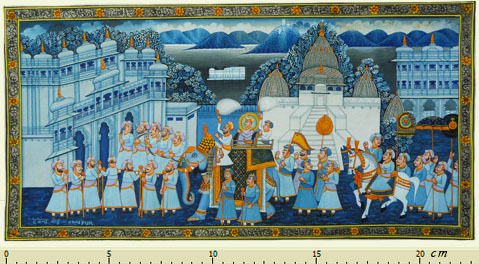 Later, these artists draw and paint the entire scene in its full grandeur inamazing detail and fineness on a small canvas, for the king to keep as a memory of the event. These were the exquisite Miniature paintings of Rajasthan in the 16th Century, the incredibly detailed enchanting visual narratives of royal festivities. Drawn on paper or sometimes ivory, the miniatures were painted with extremely fine brushes made by inserting just a few strands of squirrels’ tail hair into bird feathers. It is not just the final act of painting, which required excellence, but preparation of the colours was another effort requiring patience and perseverance. The colours were all derived from nature and many days of toil would result in extraction of a miniscule amount of rich, exquisite colour. The colour red was extracted from the dried fruit of Peepal tree, orange from Palash flower, green from leaves and black from stones. The colour yellow had a fascinating process of extraction. It was derived from the dried up urine of a sick cow. 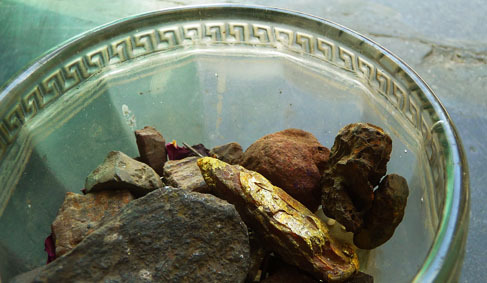 Gold or silver colours were obtained by boiling the metal with “Saras” (Camel musk) and water. It would be rubbed on a plate and ground by hand for 2-3 days to get a miniscule amount of very fine, precious concoction. 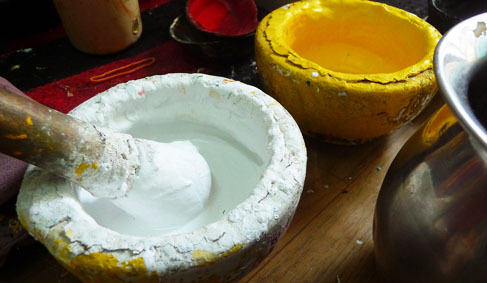 The colour would be mixed with water and natural gum to prepare it for application. It had to be made sure that the colour is extremely fine and uniform because the painting was so small, that even a tiny lump out of place would spoil it. Therefore, sometimes months were spent only in grinding the colour into a smooth paste, making sure the consistency is absolutely even. 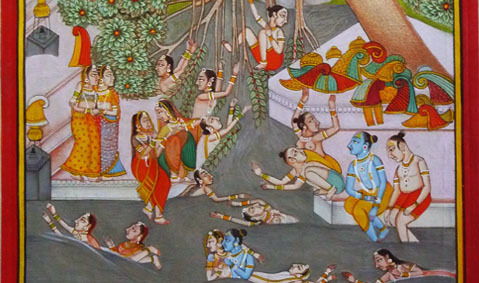 Along with depicting events in a two dimensional perspective style, the artists found another outlet for their creativity in the multiple borders, which were at times, more lavish than the main painting. The Miniature paintings of Rajasthan were originally commissioned by the Rajput kings, but Mughal influence came to be seen in them, in terms of clothing, facial features and architecture. 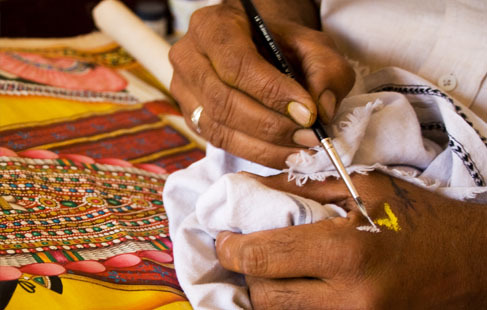 In Udaipur, Rajasthan, there are many craftsmen who have learnt this art from their forefathers, who were artists for the kings. 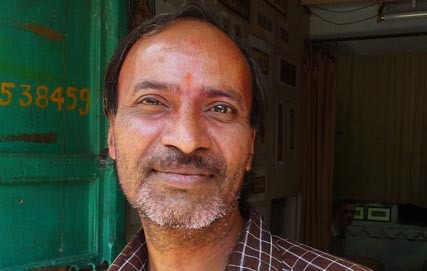 Udaipur based craftsman Devendra Kumar Guad’s great grandfather was the chief artist for the King of Udaipur and his descendants have kept this art alive. Now made for decorative purposes, the paintings depict beautiful palace or forest scenes from the artists’ imagination, on small pieces of silk or paper, but taking a closer look; it is easy to get lost in a world of detail. Irrespective of size, the painting is valued for its fineness and intricacy and the amount of time and effort that goes into it. 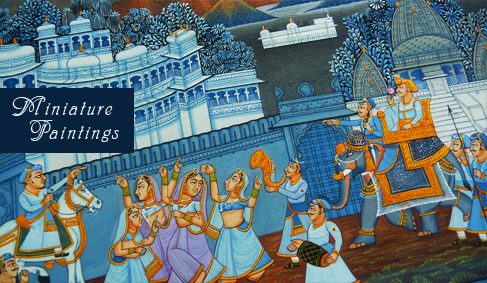 Today, even though synthetic paints and readymade brushes are used frequently, the painting style remains the same. The craftsmen sometimes still use natural colours for painting, although their extraction process is much faster and more efficient. Marble is used as a substitute for ivory, and only the highly experienced master craftsmen use marble as a base. The rest use paper or silk, which they sometimes dip in tea water to give a sepia tinge. The paintings are small in size, but they are extremely detailed and elaborate and this requires a high degree of skill and experience. In the intricate design, there is no way to hide even a small brushstroke gone wrong. Recording history through artistic expressions has been a part of human nature, from the cave paintings of the Stone Age, depicting hunting and dancing scenes to digitally created prints in thousands of colours. Today,technology is making us immune to the marvelous skill of hands that create delicate beauty. Sometimes, we fail to appreciate the amount of hard work and focus that the artists have to put in and how much practice and concentration is required for continuance of this medieval art. 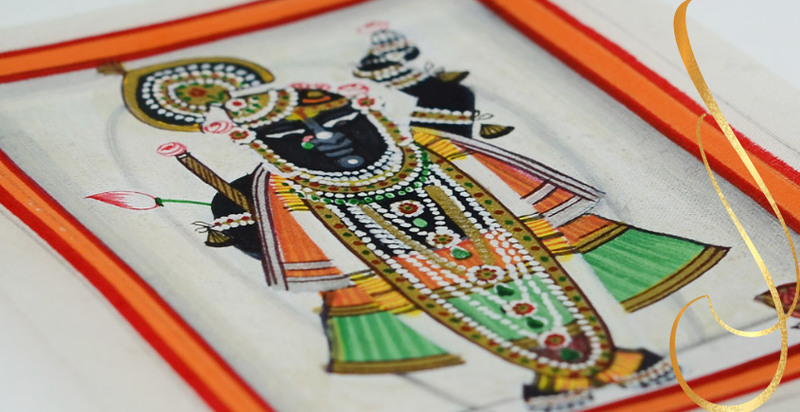 The craftsmen and their Miniature paintings prove just that sometimes a palm sized masterpiece can be many times more valuable than a grand scale work of art. Note We do not accept returns or exchange of the products listed in this category. Note - These paintings are hand-made and unique and may differ slightly from the snaps seen on digital screen. 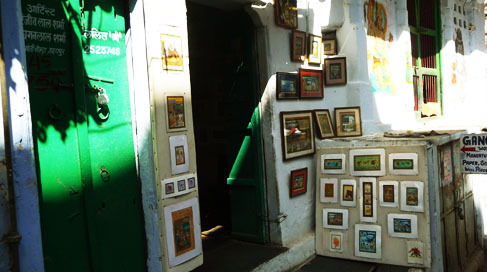 - The paintings will be shipped in rolled form or what ever is suitable as per its size. - We would suggest the buyers to frame these paintings with caution. - You would receive it in 6-7 days of placing the order. A grand procession is on its way from the palace. There are soldiers on hors..